A St. Lucia sailing itinerary has many possibilities. You could spend the entire week in St. Lucia waters to enjoy leisurely sails and sojourns ashore to shop, sightsee, and sample gourmet fare in upscale restaurants. But for most sailors the attraction of the Eastern Caribbean is the chance to combine open-water, down-island romps in fair winds with pleasant days of island-hopping a short distance to swim, snorkel, and experience the culture and ambience of the smaller isles in the magnificent Grenadines just south of St. Vincent. 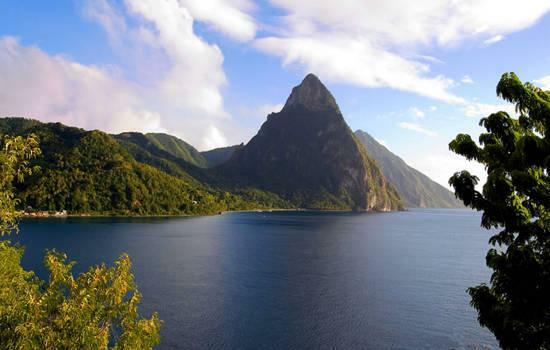 The longest passage is between St. Lucia and St. Vincent, and beyond are myriad islands in a tropical paradise. A one-way charter between St. Lucia and Canouan opens up even more time in the Grenadines because there's no need to retrace your steps. 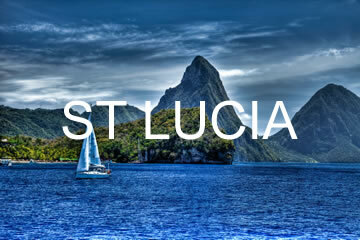 This is a very attractive alternative St. Lucia itinerary for many sailors. Marigot Bay to the Pitons - 9 nm. After enjoying a refreshing lunch at one of the many restaurants near the marina, set sail on the first leg of your adventure with a short passage along the island's western shore. The lush green rain forest rises into the clouds atop Mount Gimie and the other soaring heights that make St. Lucia so beautiful. Soon the conical twins, Petit and Gros Piton, both of which are more than 2,400 feet in elevation, appear off the port bow. Pick up a mooring north of Petit Piton, and head ashore to explore the natural wonders of the area, which include waterfalls and sulfur springs. Mooring: Moorings are available at numerous locations. Anchoring is permitted only in certain locations. Things to do: There are many restaurants along the shore and in town. The most elegant is the Hummingbird Restaurant at Hummingbird Resort. Sulfur Springs, the volcanically heated waters of Diamond Baths and its surrounding tropical gardens, guided hiking tours in the rain forest near Morne Fond St. Jacques (stop by the Soufriére Marine Management office in town for more information), Maho waterfalls, and the Jalousie Plantation (part of Sunswept Resorts) are among the attractions in and around Soufriére. Facilities: Fuel, water, ice, provisions, taxicabs, car rentals, and Internet access are available. The Pitons to Bequia - 55 nm. Awaken early to get under way for day two of your St. Lucia itinerary. Sail south with a fair wind off the beam across open waters to the high, rugged island of St. Vincent. The clouds often obscure the upper heights and appear as a cottony white smudge on the distant horizon atop a shimmering turquoise sea. This is Eastern Caribbean sailing at its best, with the sails trimmed perfectly for a fast passage to the splendid cruising grounds of the Grenadines. Many world cruisers say this part of the Caribbean is the best of the entire region. Blue Lagoon, at the south end of St. Vincent, is an excellent harbor; many sailors stop there en route to Bequia from St. Lucia. Otherwise, keep sailing the remaining distance to Admiralty Bay, Bequia's main harbor. Mooring: Moorings are available. Anchoring space is plentiful, and the holding is generally good in the more popular locations. In other parts of the bay, holding is less desirable, and northerly swells can make for an uncomfortable night. In addition to Admiralty Bay, there's a snug and picturesque anchorage at Friendship Bay, well worth a visit. Things to do: There are literally dozens of bars and restaurants, too many to list. However, a few options include the Frangipani Hotel for a romantic dinner featuring Caribbean fare, Auberge des Grenadines for sumptuous lobster and other seafood, and the Tradewinds Yacht Club restaurant, Devil's Table, which has good food for all budgets and a charming island ambience. For charterers seeking a bit of pampering, get a massage at Jack's Spa & Beauty Salon, or play a game of tennis at one of several courts. Hiking is popular on Bequia, along the beaches and on the trails in the hills of Mount Pleasant. Visit the Bequia Maritime Museum, the Old Hegg Turtle Sanctuary, or the home of one of Bequia's most famous harpooners, Athneal Ollivierre, where there's a small whaling museum. Bequia is both beautiful and filled with attractions. It's a great stop on any St. Lucia yachting itinerary. Facilities: Fuel, water, ice, showers, laundry facilities, garbage disposal, provisions, propane, Internet access (Wi-Fi too! ), and taxicabs are available. Bequia to Mustique - 14 nm. A cruise in the Grenadines wouldn't be complete without stopping at this exclusive, privately owned island, home to approximately 90 sprawling mansions of the world's rich and famous, though that's not its chief attraction. Mustique is special because it's so unspoiled. Sailors are welcome to hike and bike the roads and trails; touring via taxicab is another option. You can pick up a mooring in Britannia Bay, then go ashore to explore. Stop by Basil's Bar, one of the most famous in the Caribbean, for dinner and drinks in an informal setting. Of course, upscale dining is also available! Mooring: Moorings are available in Britannia Bay. Anchoring is prohibited without permission from the Mustique Company, which supervises local waters. Things to do: Hike the trails and quiet roads of the island, or take a tour via taxicab or rented mountain bike or motorbike. Enjoy a swim at the beautiful beach at Macaroni Bay. Horseback riding is also an option. Or experience snorkeling and scuba diving in the crystal clear waters. Facilities: Provisions, garbage disposal, Internet access at the library, and taxicab service are available. Mustique to Tobago Cays - 18 nm. A fast passage to the southwest will take you from the highly civilized and tasteful ambience of unspoiled Mustique to Tobago Cays Marine Park. These five uninhabited isles are among the most beautiful in the Grenadines and are seemingly made for sailors who love snorkeling, scuba diving, beach combing, or simply relaxing in the cockpit in a natural setting away from the bustle found elsewhere in the Caribbean. Horseshoe Reef hems in the cays, providing protection from the trade wind swells. All manner of sea life is present, including sea turtles. Mooring: Moorings are available for a fee; plans for adding some have been in the works. Cruisers may anchor in one of several locations. The anchorages north and south of Baradel are popular. Things to do: Snorkel, swim, sunbathe, and relax in unspoiled beauty. Observe the sea turtles at the sea turtle-watching area on Baradel. Contact one of the local dive companies to go scuba diving (diving on your own isn't permitted). Line up a vendor for a beach barbecue (beach barbecues are regulated to protect the park). Facilities: Entrepreneurial owners of small local boats often ply the anchorages, selling sundry items like ice, bread, and lobsters. Tobago Cays to Mayreau - 4 nm. Still very much in island mode, another day of pure leisure is in order. It's only an hour or less to the next recommended anchorage, Mayreau's Salt Whistle Bay, and along the way there's plenty to do and see. Palm Island is a wonderful spot to drop the hook and enjoy lunch ashore. Casuarina Beach is beautiful and has a pleasant beachside restaurant. A major yachting center in the southern Grenadines, Clifton Harbour on nearby Union Island hums with activity. It has plenty of shops and restaurants. Anchor for the night a few miles north in Salt Whistle Bay and enjoy dinner at the Salt Whistle Bay Club. Mooring: No moorings are available. Holding is good in a sandy bottom. Things to do: Snorkel, swim, sunbathe, and relax in unspoiled beauty. Contact one of the local dive companies to go scuba diving (diving on your own isn't permitted). Enjoy dinner at the Salt Whistle Bay Club or sip drinks at the beachside bars. Facilities: No facilities for yachts are available. 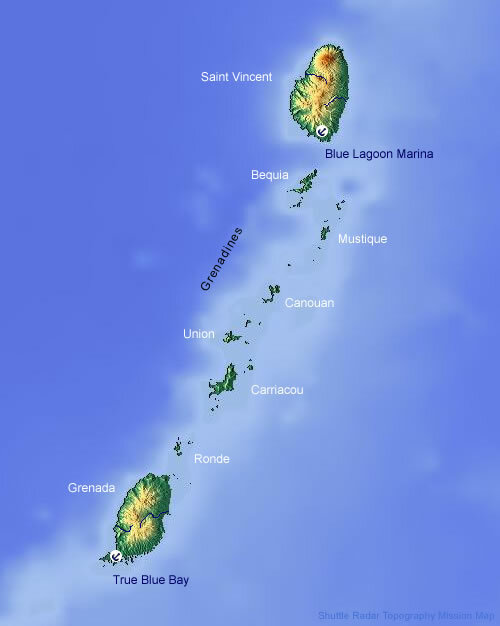 Mayreau to Bequia - 24 nm. 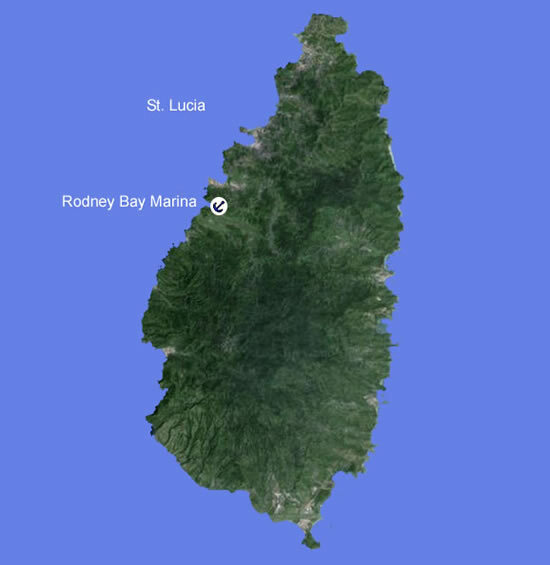 For sailors on a round-trip St. Lucia sailing itinerary, it's time to make the miles north back to Bequia's Admiralty Bay. Another stop there will provide additional time to sample the island's delights. Hike or take a taxicab to the top of Mount Pleasant, check out the Old Hegg Turtle Sanctuary, visit the Bequia Maritime Museum, window shop, or dine ashore at one of the many restaurants, ranging from casual to the more upscale. An alternative well worth considering is beautiful Friendship Bay, on the south side of the island. It's quiet, the white-sand beach is beautiful, and the anchorage is well protected from northerly swells. The views of Petit Nevis and Isle de Quatre are captivating. Bequia to The Pitons - 53 nm. Getting under way early for the passage north past St. Vincent and back to St. Lucia will provide the best of both worlds: a fun open-water sail with time to enjoy the beauty of the Pitons and the town of Soufriére. Treat yourself to a fine meal at one of the restaurants. The Pitons to Marigot Bay - 9 nm. Although you won't want to sail back to reality (you can always come visit St. Lucia again! ), the final leg of your charter will be a quick jaunt north back to the Moorings base. Please check in by noon.